Help... Please check my stats, connection keeps dropping! Had sky for around a month having left VM. First 2-3 days was fantastic very impressed with speed and performance, since then its been poor. The modem keeps dropping the connection, with 'page cannot be displayed' on both computers at which point you have to unplug the modem. 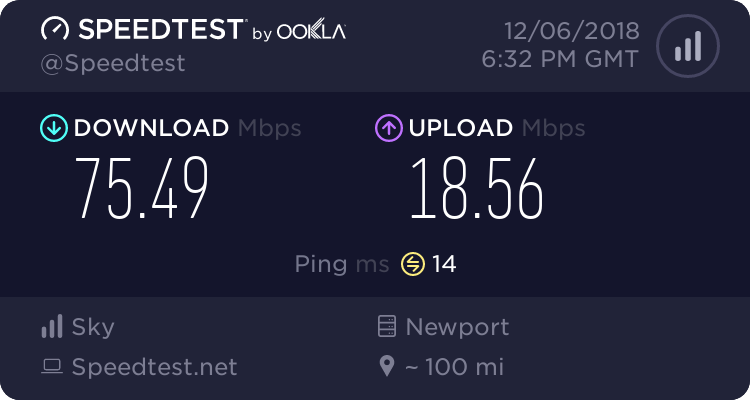 I moved the modem downstairs to the main bt socket, I have turned of the upnp and switched the mode to auto 108mbps, but still the connection drops. Your help would be greatly appreciated, thanks. Re: Help... Please check my stats, connection keeps dropping! You really need to plug in to the TEST socket. This rules out any faulty internal wiring, being a direct connection to the phone line. This socket is located behind the face plate of the Master socket. Others may confirm, but I think you have been capped, probably to reduce line errors. If these can be reduced your connection will improve. Can you confirm whether you are using wireless or ethernet? Im using wireless as modem is down stairs in the main bt socket, how do i use the test socket?